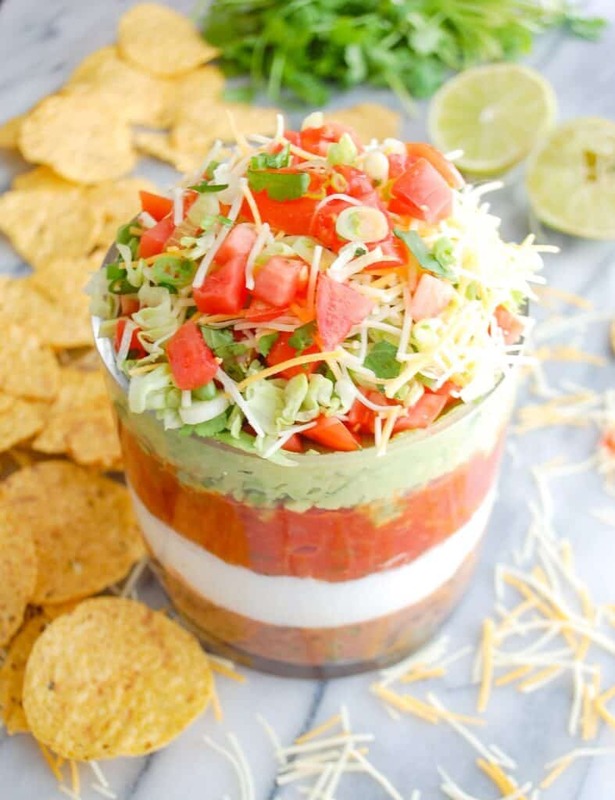 Healthy seven layer dip making all your football game snacking dreams come true! This simple recipe is loaded with healthy ingredients like Greek yogurt instead of sour cream, fresh beans instead of refried, and fresh vegetables! 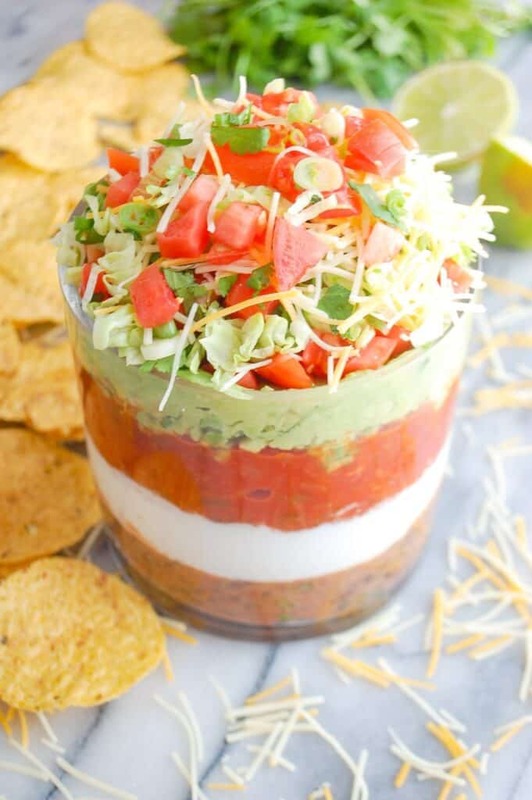 You better believe we are going to be devouring this healthy seven layer dip when the Superbowl approaches next week. So what makes it healthy? Well each layer is made with fresh ingredients made with less fat and more nutrients than the typical recipe. 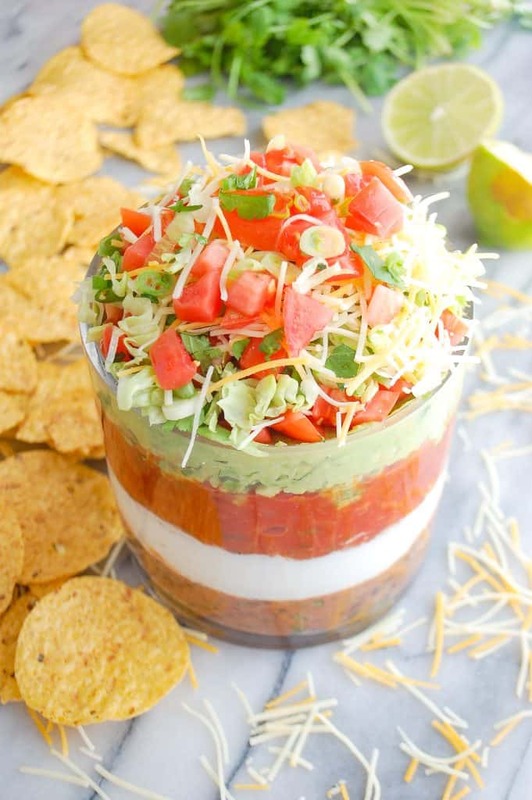 We use Greek yogurt in place of sour cream, fresh beans mashed with spices instead of refried beans, fresh avocados mashed with lime and salt to make guacamole, and lots of fresh vegetables on top! I made this a few weeks ago for my family before we were watching the Eagles game and everyone loved it. We ate it along side of tortilla chips, fresh vegetables like celery and carrots, and we even were dipping pretzels into it. We saved some of the leftovers and my boyfriend got to try it later and he was absolutely obsessed with it, too. Trust me when I say that people will gather around this layered taco dip until it is gone! 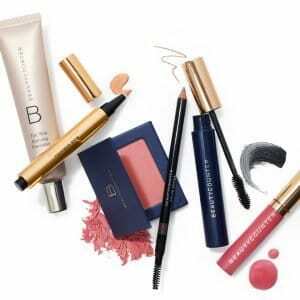 So next time you’re headed to a party and need to bring an appetizer? 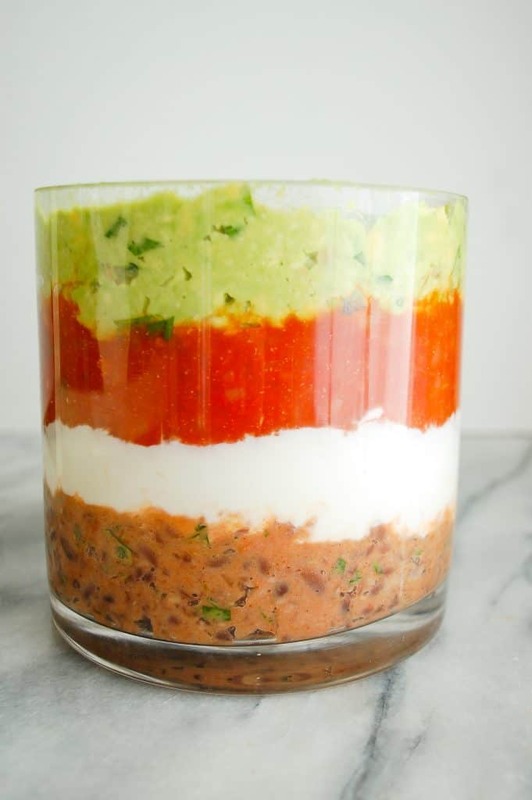 I’ve got you covered with this healthy seven layer dip! Alright, so you want to start with the beans at the base because they will hold firm for a good bottom. 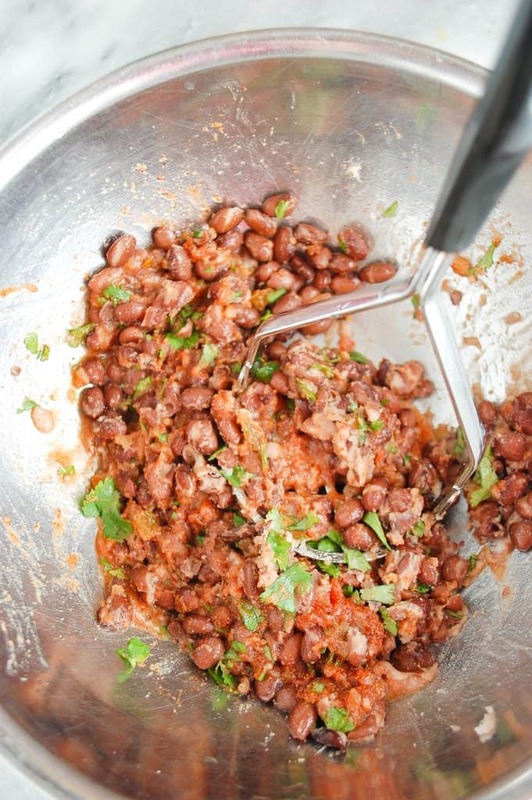 Once you have drained and rinsed your beans, place them into a bowl and mash them up with a fork or potato masher. Add in some fresh cilantro, salsa, homemade taco seasoning, and mash it all up until the beans have lost their shape. 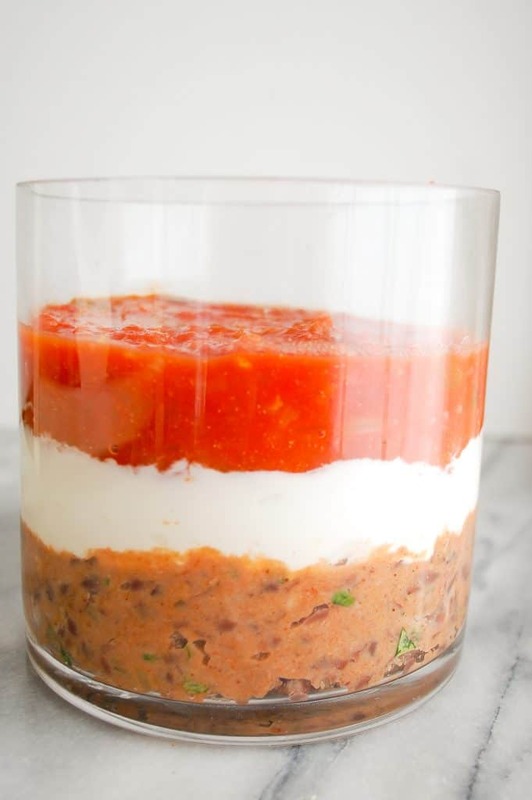 For the next layer, add in plain greek yogurt and layer it on top. Next up comes the salsa and then you can start to prepare the guacamole layer. Using two ripe avocados, mash them up with a fork or potato masher, add in some fresh lime juice, cilantro and salt and try not to eat it all before piling it on to the next layer! 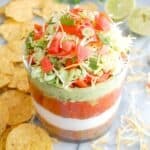 Top the guacamole layer with fresh shredded lettuce, tomatoes, and shredded cheese. 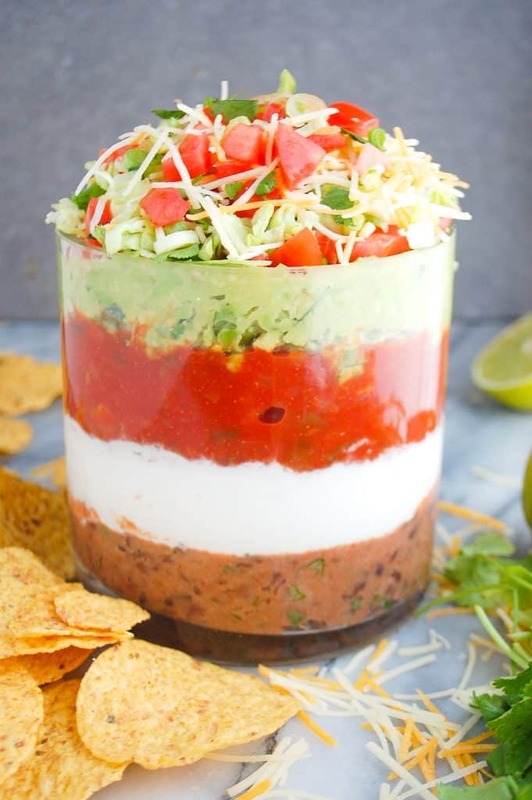 Top with green onion and you got yourself one heck of a delicious healthy seven layer dip! Serve with your favorite tortilla chips, on top of tacos, just make sure you share with friends! 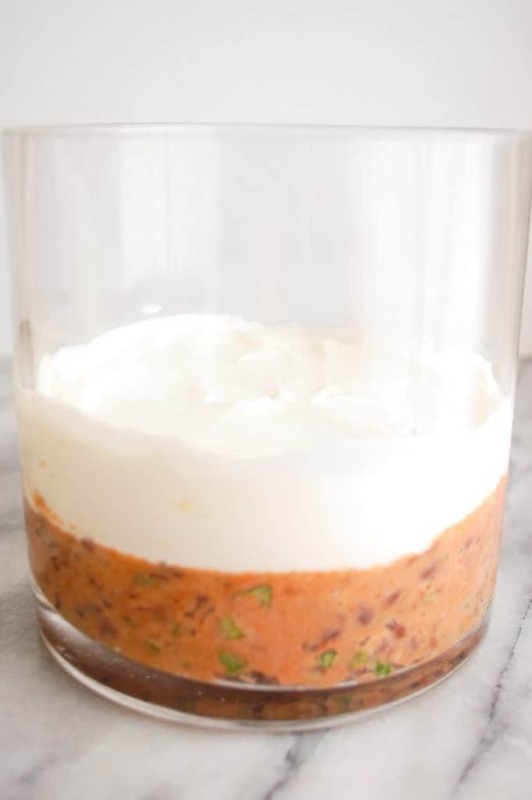 Looking for other recipes similar to this? Place them into a bowl and mash them up with a fork or potato masher until they lose their shape. Add in 1/4 cup cilantro, 1/4 salsa, and taco seasoning and mash more. It’s okay to have some chunks. Layer into bottom of dish with spoon. Spoon in the Greek yogurt layer next. Then pour in the remainder of the salsa for the next layer. Make the guacamole layer by mashing two avocados with a potato masher or fork. Add in the juice of one lime, the rest of the cilantro, and 1/4 tsp salt. Pile it on top of the salsa. Add the shredded lettuce, tomatoes, cheese, and green onion on top. Refrigerate or serve! 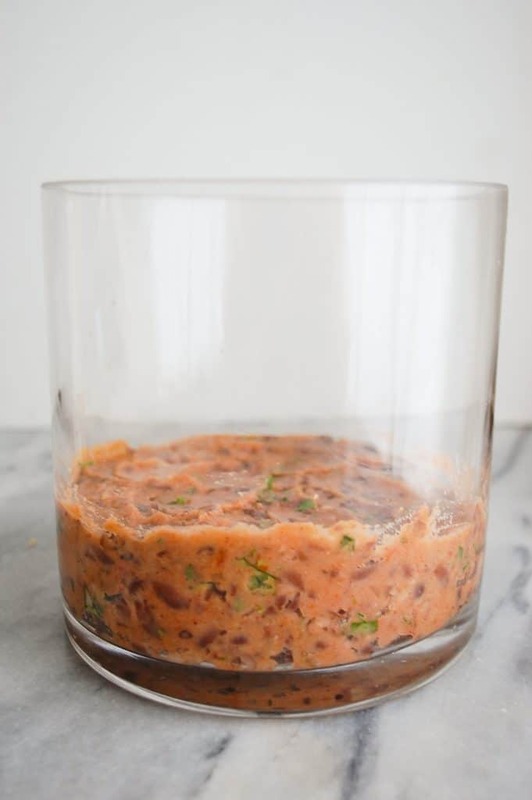 Stays good in the fridge for 24 hours, until the avocado turns brown. We still ate the rest of ours for the remainder of the week!